Diamonds are a girl's best friend but so is data. While crystals aren't exactly diamonds, you can accessorize with something at least as valuable, and just as sparkly - USB flash drives. Philips and Swarovski have partnered to create Active Crystals, a line of USB flash drives that fuse fashion and function. 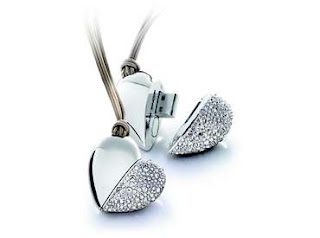 Heart Beat, one of four different models, is a heart-shaped, crystal-encrusted pendant that open up to reveal a USB connector. The drive features built-in password protection, because for you, 1 gig is definitely worth more than 1 carat.